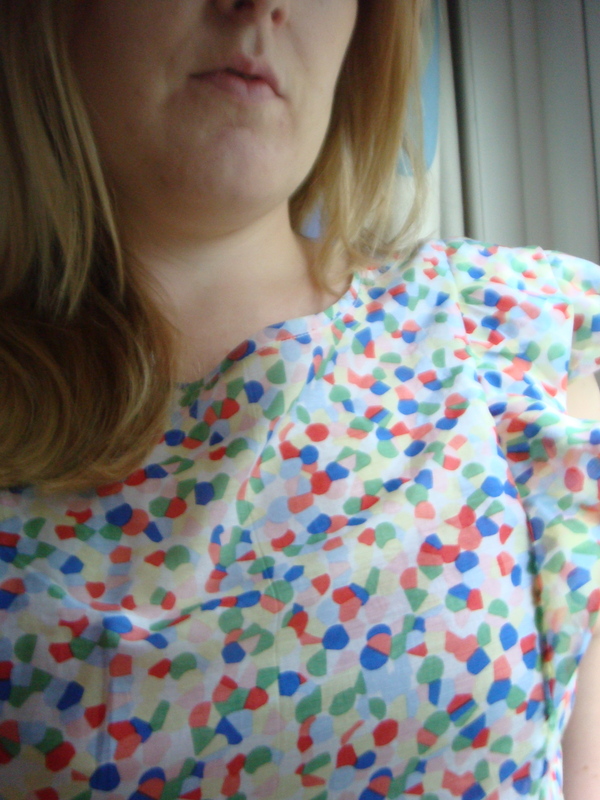 I’ve been meaning to try the Pendrell blouse from Sewaholic patterns for months. It took the blogging world by storm, with many bloggers making multiple versions. Mainly because it’s quick and easy. If you are time strapped, this doesn’t take a long time even if you decide to put the ruffles in! I probably took about 5 hours to do this last night – I should mention that’s not 5 hours straight. That’s me making some dinner, talking to people on the phone and general pottering around my flat! I made version B, which is described as a fitted pullover blouse with princess seams and binding at neck and armhole. Featuring ruffled cap sleeves and ruffles inserted into the princess seams. It’s a multisize, available from 0 to 16. I made it up in a size 16. (I couldn’t be bothered to make a muslin). The instructions are really easy and straightforward. I love the instructions, they are so easy. And I love how long the pattern is, perfect for tall ladies! I don’t really like the neck/arm binding, if I do it again, I will make proper bias binding. A lovely light cotton from Fabrics Galore. I want to say it’s a voile but it’s not that sheer but it is still very light and floaty. This pattern is definitely for the pear shaped lady. So I really had to take it in at the hips. Instead of making a muslin and redrafting the pattern, I just made it up then removed the excess at the sides and at the front princess seams. Other than that I wouldn’t make any other additions. Yes, I would definitely recommend it to others and I probably will make it again. It’s so quick and easy! Great project for beginners and in my opinion, a very pretty blouse design! Ok, I’m off the fence now- I must have that pattern! Beautiful! Fabulous! I love it! The ruffled version is next on my list!! Thank you ladies! I wholeheartedly recommend this project, so easy. I’m already planning my next! What a very cute incarnation of the pendrell! love it.